We know that, come February, most of you munchkins will be in need of some valentines. So, being who we are, we could only think of one thing to do. Hint: It's more about making Munchkin-themed stuff for you and less about romance. 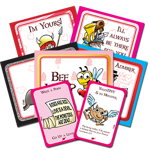 Munchkin Valentines are hitting stores in January 2017! These are actual valentines. They come in packages of five cards with envelopes sized to fit. (Five is a decent number of shots at l'amour, right?) The card art is from original Munchkin illustrator John Kovalic. Of course, they're not just any valentines – they're Munchkin valentines . . . so they're also a way to give your friends that Munchkin love fever. 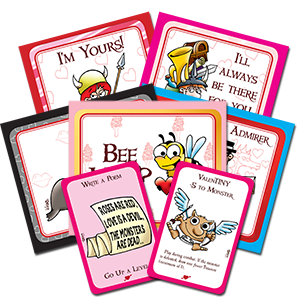 Slip cards inside the valentines, and your recipients will be so intrigued, they'll fall for both you and Munchkin! 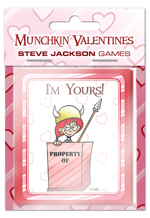 That's when you spring your real trap: a game of Munchkin, supplemented by the 15 love-struck cards of Munchkin Love Shark Baby! You clever so-and-so. 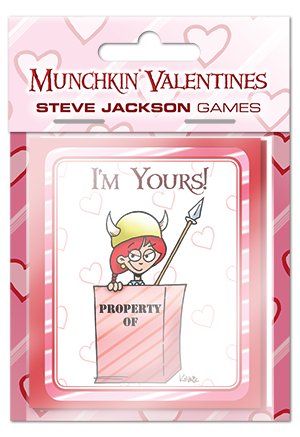 Does that mean this item is more a Trojan Horse for Munchkin fandom, which we're hoping you'll deliver for us, than it is an honest set of valentines? Um. That's for you to decide.